As visitors open the front door to Edwards Place in Springfield, they immediately find themselves transported to a mid-19th century home. Erika Holst, the curator of collections, takes visitors on tours and keeps up an informative patter. “We are standing now on the back porch of the house as it was in 1833. The owners remodeled in 1857 and they enclosed the back area, which would have been the side of the house in 1833. The exterior would have been whitewashed because the back porch would have been a workspace, so we built in these windows so we wouldn’t lose what we discovered.” Those small windows open to expose the original whitewashed bricks, discovered through a recent renovation. 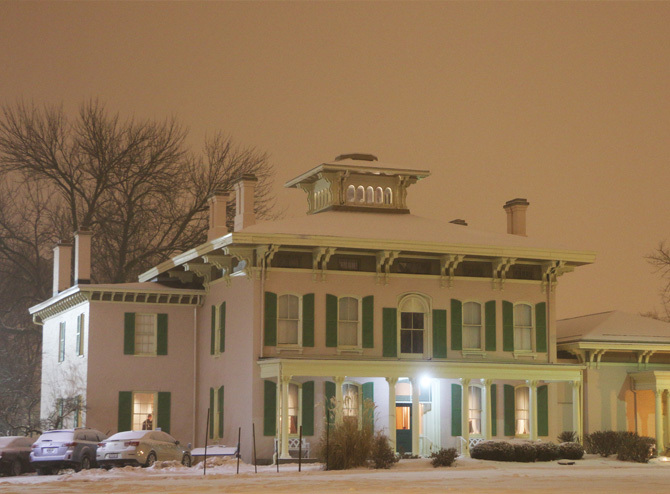 Constructed in 1833, Edwards Place is the oldest house in Springfield. Through fundraising and matching grants, the first floor of the home was recently restored and officially reopened in late February. 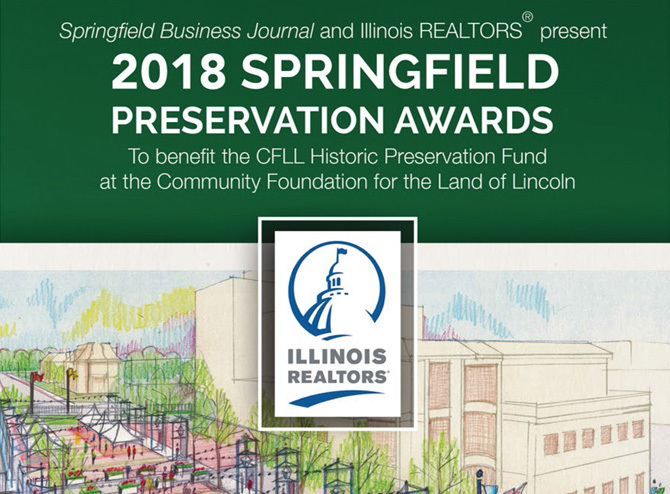 As the city of Springfield readies itself for the 150th anniversary of President Lincoln’s funeral, Betsy Dollar, the executive director of the Springfield Art Association, sees the event as a perfect opportunity to showcase the home’s historical significance. “It’s actually nice timing that there is this big event that’s getting national attention, it’s like our debut party,” she says. The home was owned by Benjamin Edwards, the youngest son of Illinois Governor Ninian Edwards and brother-in-law of Mary Lincoln’s sister. The Lincolns did spend time at the home, and the most famous artifact in the home, the courting couch where Lincoln and Mary Todd sat during their courtship, has a place of honor. 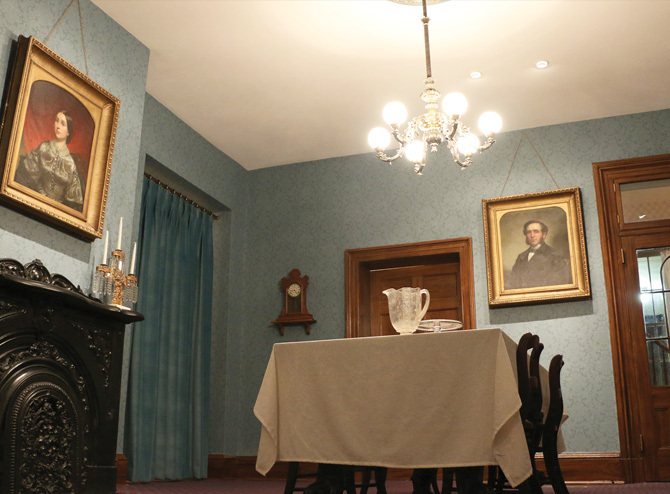 During the weekend honoring the anniversary of Lincoln’s funeral, Edwards Place will host three Victorian mourning teas in which participants will learn about mourning customs of the time. Even though all of the teas are sold out, there are still opportunities available to experience the history of Edwards Place throughout that weekend. Civil War re-enactors will be camping out on the lawn of the Edwards Place and the Springfield Art Association May 1, 2 and 3, serving as the headquarters for the 10th Cavalry. Edwards Place will also be open for special tours on Sunday, May 3, from 10 a.m. – 1 p.m., which includes period-appropriate refreshments. Some seven million people viewed Lincoln’s body or watched the funeral train pass by on its 12-day trip to Springfield in 1865. The reenactment of the procession to the cemetery and Lincoln’s funeral will take place May 3. Organizers expect thousands of visitors this year, and some are creating a map to help out-of-town visitors find their way around. As Dollar said, “We don’t want tens of thousands of lost people in downtown Springfield. The Enos Park Neighborhood Association in conjunction with the Springfield Art Association, Downtown Springfield Incorporated, and the Company’s Coming committee are creating a map that shows the route of the procession and as many event times and locations as we can include.” The maps will be available in mid-April at the Springfield Art Association and the visitors center, along with downtown businesses, hotels and restaurants. In terms of Edwards Place, Dollar and Holst hope the attention the home receives during the anniversary weekend will help jump-start interest in the renovation of the second story, a renovation they hope will help take the house museum into the 21st century by making it more cutting-edge and appealing to visitors. Ann Strahle is an assistant professor in the Communication department at University of Illinois Springfield.